Today's doll is this lovely miss. She's Best Friend Cynthia. She's often referred to as just 'Cynthia',but it does actually say 'Best Friend' in very small letters over the word 'Cynthia; on her box. 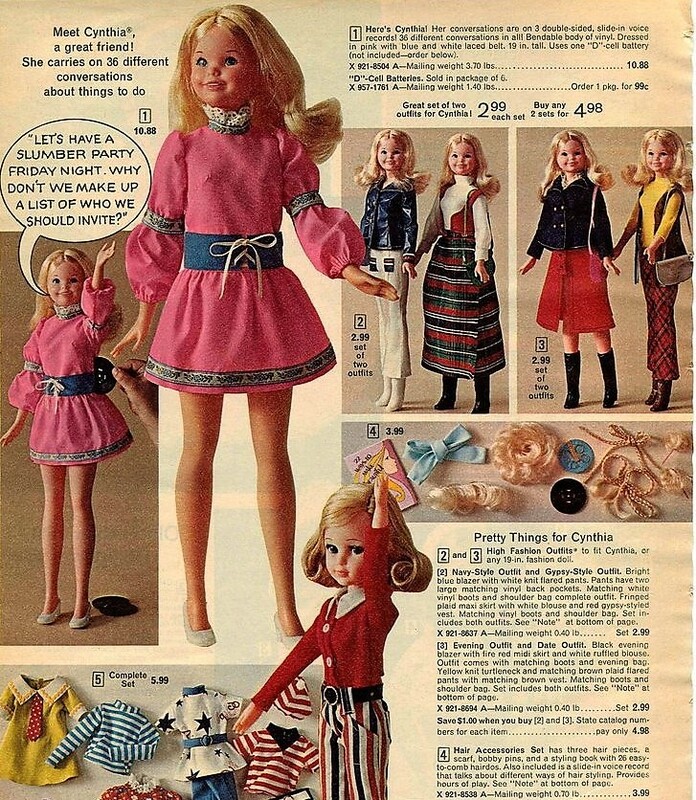 She was made by Mattel in 1971. Her blonde hair reaches nearly to her waist. She has a cute,young looking face. Her original outfit consisted of this dress,which snaps in the back,and white low heel shoes. The belt is connected to the dress. With Cynthia Mattel took a giant step backwards in talking dolls. Talking dolls had long talked using the tried and true pull string method,powered only by it's own force. Cynthia talked by use of records that were slipped into her side,like Charmin Chatty,and was powered by batteries in her back. The record slot in her side. The battery compartment in her back. The speaker holes in her belly. Cynthia came with three two sided records that equaled thirty six conversations. Her dress is made with a space for inserting the records in her side. 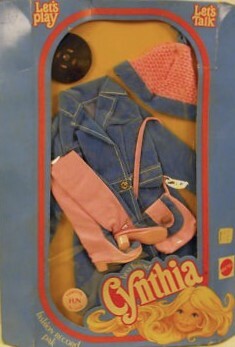 Mattel also made a wardrobe and hair accessories for Cynthia. The extra outfits each came with a new record. The hair accessories came with a new record that talked about hair styles. In 1971 Mattel also produced a doll called Quick Curl Casey. (There's Mattel reusing names again.) Casey used the Cynthia head sculpt, but Casey was a brunette. Casey didn't talk. Her gimmick was her 'quick curl' hair. That's the doll for today. See what doll we have tomorrow. Cool blog! I love these two dolls, although I am unsure about the date on Quick Curl Casey, because all of the information that I have lists the date as '74. It's so awesome to be able to see actual ads for Cynthia! I've never seen these ads before! Cynthia's Evening Outfit reminds me of an outfit that my mother wore during the 1970s, except that, in my mother's case, the jacket wasn't so flared, and both the jacket and the skirt were made of red corduroy. I once wore that outfit for some pictures, and that was around 2009, or so. It was fun to be able to wear a Retro. fashion! Everything I found says Quick Curl Casey was produced between 1971 and 1973,during the run of the Quick Curl Barbie and friends dolls. If either of us had a boxed Casey we could read the date on that. How nice that your mom's outfit was still around for you to wear all those years later. I have a few of my mom's clothes,but hers are from the 40's and 50's. They only got saved because we had them in our dress up clothes!